It’s been a while, so let me update you. Since you last heard from me, I’ve finished up a lot of exciting things and started prepping for the next steps in my life’s journey. I finished up my independent study, which ended up being way more interesting and engaging than I imagined going in. It’s called “Brand Personification in the Digital Age: How has the evolution of social media impacted consumer-brand relationships?” and if you’re interested, you can check it out here. Exactly one week ago, I graduated from the University of Michigan. Which is absolutely insane — I miss Ann Arbor and all my friends already, but I’m excited for my next steps. A couple days ago, I signed a lease for my first year in Richmond at VCU Brandcenter with a couple of GREAT girls! AND I found out I’ll be living on a BOAT in Sausalito, California for the summer as part of my internship at Butler, Shine, Stern & Partners! I plan to use this blog a great deal throughout the summer to keep everyone up to date on my experience in San Francisco, so keep an eye out. And my latest AWSC post should be all the way live real soon — I’m SO excited about this one. It’s all about digital vs. traditional publishing and how we love on the interwebz. If you haven’t already, take a look at Robin Sloan’s revolutionary tap essay, “Fish” — promise it’s worth your time. Moving on, I’ve had this link on my desktop for a while now and finally found the time to share. There’s been a lot of great work circulating as it relates to cause marketing lately; but the most powerful example I’ve seen is Grey Spain’s work for Aid to Children and Adolescents at Risk Foundation (ANAR for short). The outdoor ad made use of “lenticular printing” in order to create an ad that changed based on the perspective you viewed it from. 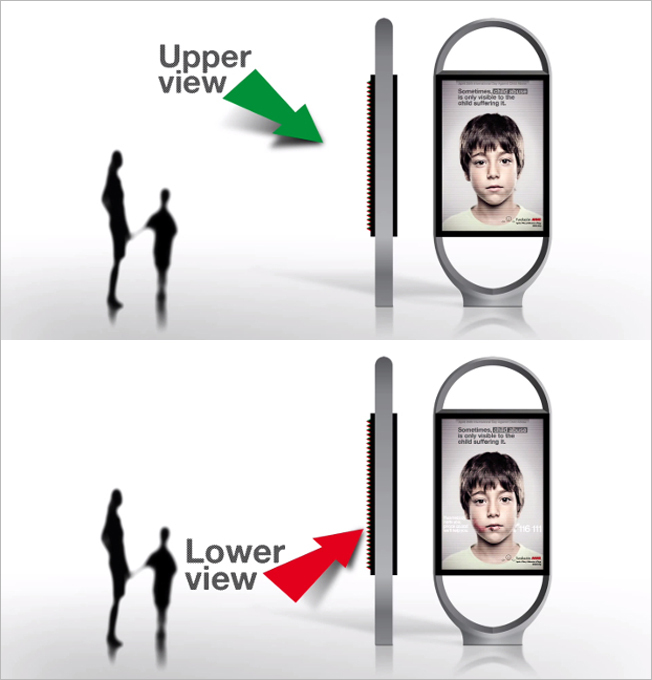 Adults (well, those over 4’5″) see an image of a sad child with the copy, “Sometimes, child abuse is only visible to the child suffering it.” Children, on the other hand, see bruises on the child’s face and the copy, “If somebody hurts you, phone us and we’ll help you.” Brilliantly executed, the secret message allows a child to see the message even when accompanied by his or her abuser. Grey Spain uses lenticular printing to create dual-images. Digiday put it best — “It’s a powerful message that’s enabled by technology, rather than overwhelmed by it,” an issue that often comes into play when technology is put into play for technology’s sake only. Sure, it can be cool, but does it add anything? It most certainly does here. This gets me so excited to work alongside the talented art directors and creative technologists at VCU Brandcenter in the fall. With such amazing technology at our fingertips, I can’t wait to see what we’re able to produce together.